Anyways..J4M8u had its rear wheel rubbing against the fender, causing the car to spin whenever I pitch the car beyond a certain angle..Hellaflush can be HellaDumb at times!! Jane improved by leaps and bound with her drifting. She has plans for her Blackie to undergo some upgrades soon!! So both of our missles will have some work done to them ! This entry was posted in Drifting, Posting by Ariff on October 18, 2011 by skagee. This entry was posted in Drifting, Posting by Ariff on October 16, 2011 by skagee. Jane and I were invited to help organise and judge the inaugural drift competition by KSOC title 1 Malaysia Drift Challenge. The event was held at a BSA Futsal parking lot where a simple but very technical course was laid. With over 23 drifters from all over east Malaysia, this competition showcased an impressive level of drifting .However, though their skill were high, the lack of experience of competitive drifting were prevalent amongst them. In particularly , the qualifying jitters which plagued half of the field .where these drifters performed flawlessly during practice but failed miserably during qualifying. Heng was a victim, to name a few, who looked all set to dominate the competition with his aggressive yet precise practice runs but somehow couldn’t hold it together during qualifying thus failing to enter the best 16!! The competition went smoothly with a few very close judging calls made . I had specifically mentioned what I was looking for during the drivers briefings and made consistent judging calls based on it. 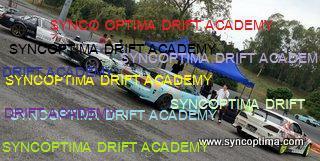 This entry was posted in Drifting, General Events, Posting by Ariff on October 12, 2011 by skagee.